Jenny Wagner and Ron Brooks. Puffin Books. 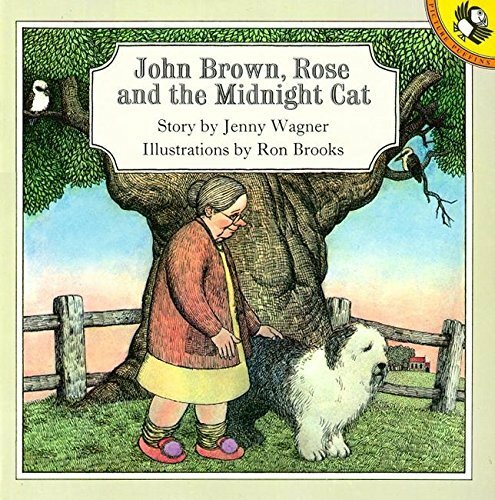 John Brown, Rose and the Midnight Cat was one of my favourite books as a kid. I can remember watching people read it on Play School and the Book Place as a kid. I loved the illustrations and thought the story was warm and endearing. When I fell pregnant in 2013 I knew I wanted to purchase this book to read to my daughter. I tracked down a copy and was so happy to be able to read it again. It was just as lovely as I remembered it was. John Brown, Rose and the Midnight Cat was written by Jenny Wagner and illustrated by Ron Brooks. It was first published by Kestrel Books in the UK in 1977 and was published by Puffin Books in Australia on the 1st of May in 1980. It was awarded the Picture Book of the Year award in 1978 by the Children's Book Council of Australia Awards. Jenny Wagner was born in the UK and now lives in Queensland with her husband. Ron Brooks has illustrated a number of children's books in his career, most notably John Brown, Rose and the Midnight Cat and the Bunyip of Berkeley's Creek. John Brown, Rose and the Midnight Cat tells the story of an old lady named Rose who lives alone with her faithful companion John Brown the dog. Rose used to live with her husband as well but he died a long time ago. John Brown looks after Rose as well as a very good boy can. He follows her around the house when she does her chores. He watches her as she sleeps and curls up at her feet when she sits underneath her favourite tree. John thought that nothing would ever come between them. But then one night Rose spots a black cat in the garden. She names him the Midnight Cat. Rose wants to invite the cat in and make friends with it, but John doesn't want to share her with the cat. Will John be able to swallow his jealousy and let the Midnight Cat into their lives? This is a lovely book but it is also a bit sad. Other than the husband that is mentioned, Rose has no other family in her life except for John Brown. There is a fondness in her expression when she looks at him, but also sadness. Rose is lonely and bored, which is why she reacts with excitement when she finds the cat. She wants another companion in her life and thinks that the Midnight Cat might be just the ticket. Why? John Brown, Rose and the Midnight Cat is a children’s picture book classic about an old lady, her dog John Brown, and a new friend who comes to visit them at night.